The main aim of dynamic imaging is to study the physiology (function) of the organ in vivo. Typically the image sequence has constant morphologic structures of the imaged organs but the regional voxel intensity varies from one frame to another, depending on the local tissue response to the administered contrast agent or radiopharmaceutical. In the past, analysis of such dynamic images involved only visual analysis of differences between the early and delayed images from which qualitative information about the organ, for instance, regional myocardial blood flow and distribution volume are obtained. However, the sequence of dynamic images also contain spatially varying quantitative information about the organ which is difficult to extract solely based on visual analysis. This led to the method of parametric imaging where dynamic curves in the image sequence are fit to a mathematical model on a pixel-wise basis. Parametric images whose pixels define individual kinetic parameters or physiologic parameters that describe the complex biochemical pathways and physiologic/pharmacokinetic processes occurred within the tissue/organ can then be constructed. This approach is categorized as model-led technique that utilizes knowledge and a priori assumptions of the processes under investigation, and represents the kinetics of the measured data by an analytical (or parametric) model. At the opposite end of the spectrum of model-led techniques are data-driven techniques, which are based on the framework of multivariate data analysis. These paradigms minimize the a priori assumptions of the underlying processes whose characteristics are interrogated from the measured data, independent of any kinetic model. Multivariate approaches have been explored and successfully applied in a number of functional imaging studies. The aims borne in mind when applying these approaches are to (1) classify structures present in the images, (2) extract information from the images, (3) reduce the dimensionality of data, (4) visualize the data, and (5) model the data, all of which are crucial in data analysis, medical research, data reduction, and treatment planning. In general, the underlying structures are identified and extracted based on the temporal information present in the sequence of the medical images. The implicit assumptions for the validity of applying these approaches are that the statistical noise present in the images is uncorrelated (independent) between different frames and that there is a high degree of correlation (similarity) between tissue TACs if they are originated from similar structures. In this section, we focus our attention on four techniques among many different multivariate analysis approaches and their applications in dynamic, functional imaging are discussed. where tj (j = 1, 2,..., N) represents the time instant at which the jth frame is acquired, Xi(tj) is the pixel value of the ith element evaluated in the jth frame of X, for j = 1, 2,..., N, and T denotes the transpose operation. The similarity between the reference time-intensity curve r and the time-intensity curves for all pixels can then be calculated. And a similarity map, which is a image where the value of each pixel shows the temporal similarity to the reference curve, can be constructed. Time-intensity curves similar to the reference curve will have high-correlation values and are bright in the similarity map, whereas those with low-correlation values are dark. Therefore, structures in the dynamic image sequence can be segmented from the similarity map based on their temporal changes rather than spatial similarities. It should be noted that cross-correlation does not depend on the absolute magnitude of the time-intensity curves. Regions whose time-intensity curves are differed from the reference curve r by an additive or by a multiplicative constant, will have a perfect positive correlation (+1). By using different reference ROIs, a series of similarity maps containing different segmentation for regions that have similar or different temporal kinetics can be obtained. It was used to investigate local changes and segmentation of rabbit kidney on spatially aligned image sequences obtained from dynamic MR imaging of Gd-DTPA . The similarity mapping technique has also been applied to brain activation studies to extract the activated regions and their temporal dynamics . The same technique has also been used to segment the area of ischemia in the left coronary artery territory, lung tumor, and tentorial meningioma, and localize the focal ischemic region in brain . Principal component analysis (PCA), also called Karhunen-Loeve transform or Hotelling transform, is probably the most famous method in multivariate data analysis . It was developed independently by Pearson  in 1901 and Hotelling  in 1933. It has been widely applied in a number of scientific areas such as biology, chemistry, medicine, psychology, and the behavioral sciences. Given a set of multivariate data, PCA explains the variance-covariance structure by linearly transforming the (possibly) correlated variables into a smaller set of uncorrelated (orthogonal) variables called principal components (PCs). The first (highest order) component maximally accounts for the variation in the original data and each succeeding component maximally accounts for the remaining variation present in the original data. In other words, higher order components are important as they explain the major variation (also the feature) in the data, whereas lower order components are unimportant as they mainly contain noise, which can be discarded without causing too much loss of information of the original data. Therefore, dimensionality reduction (or data compression) can be achieved using PCA technique. Separation of tissue types characterized by different features can also be accomplished by careful inspection of the PCs. This is because each PC contains only the representative feature that is specific to that PC and cannot be found elsewhere (theoretically) owing to orthogonality among PCs. which is a N x N symmetric matrix. The elements of Cx, denoted by cki, represent the covariances between the random variables xk and xl , whereas the element ckk is the variance of the random variable xk. 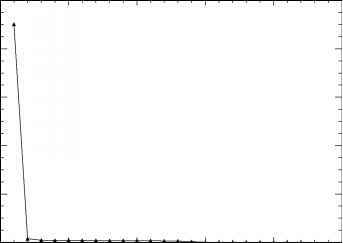 If xk and xl are uncor-related, their covariance would be zero, i.e., cki = clk = 0. The mean and the covariance matrix of a sample of random vectors xi can be estimated from its sample mean and sample covariance matrix in a similar manner. where U is a N x N column-orthogonal matrix, V is a N x N orthogonal matrix that contains the eigenvectors, and A is a N x N diagonal matrix whose squared diagonal elements correspond to the eigenvalues. However, the difference between SVD and the eigen-decomposition should be noted, in particular, the eigen-decomposition of a real matrix might be complex, whereas the SVD of a real matrix is always real. where O-1 = Ot since O is an orthogonal matrix. The practical issue here is the choice of K beyond which the PCs are insignificant. The gist of the problem lies in how "insignificant" is defined and how much error one could tolerate in using less number of PCs to approximate the original data. Sometimes, a small number of PCs are sufficient to give an accurate approximation to the observed data. A commonly used strategy is to plot the eigenvalues against the number of PCs and detect a cut-off beyond which the eigenvalues become constants. Another approach is to discard the PCs with eigenvalues lower than a specified fraction of the first (largest) eigenvalue. There is no simple answer and one has to trade off between errors and the number of PCs for approximation of the observed data which is the primary concern when PCA is used for data compression. PCA has been applied to analyze functional images including nuclear medicine [72-77] and dynamic MRI [78, 79] where data visualization, structure and functional classification, localization of diseases, and detection of activation patterns are of primary interests. Moeller and Strother  applied PCA to analyze functional activation patterns in brain activation experiments. Strother et al. revealed an intra- and intersubject subspace in data and demonstrated that the activation pattern is usually contained in the first PC. A later study conducted by Ardekani et al. further demonstrated that the activation pattern may spread across several PCs rather than lie only on the first PC, particularly when the number of subjects increases and/or multicenter data are used. PCA was also applied to aid interpretation of oncologic PET images. Pedersen et al. applied PCA to aid analyze of dynamic FDG-PET liver data. Anzai et al. investigated the use of PCA in detection of tumors in head and neck, also using dynamic FDG-PET imaging. It was found that the first few highest order component images often contained tumors whereas the last several components were simply noise. Figure 3.2: A sequence of dynamic neurologic FDG-PET images sampled at the level where the internal carotid arteries are covered. Individual images are scaled to their own maximum. proposed as a noninvasive method that obviates the need of frequent blood sampling. Delineation of larger vascular structures in the myocardium is relatively straightforward. In contrast, delineation of internal carotid artery in the head and neck is not trivial. A potential application of PCA is the extraction of input function from the dynamic images in which vascular structures are present in the dynamic images. Figure 3.2 show a sequence of dynamic neurologic FDG-PET images sampled at the level in the head where the internal carotid arteries are covered. Figure 3.3 shows the highest 12 PC images. The signal-to-noise ratio (SNR) of the first PC image is very high when comparing with the original image sequence. For PC images beyond the second, they simply represent the remaining variability that the first two PC images cannot account for and they are dominated by noise. The internal carotid arteries can be seen in the second PC image which can be extracted by means of thresholding as mentioned before in sections 3.4.1 and 3.4.4. Figure 3.4 shows a plot of percent contribution to the total variance for individual PCs. As can be seen from the figure, the first and the second PCs contribute about 90% and 2% of the total variance, while the remaining PCs only contribute for less than 0.6% of the total variance individually. Figure 3.3: From left to right, the figure shows the first six principal component (PC) images (top row), and the 7th to 12th PC images (bottom row) scaled to their own maxima. All but the first two PC images are dominated by noise. The higher order PC images (not shown) look very similar to PC images 3-12. This means that large amount of information (about 92%) is preserved in only the first two PCs, and the original images can be approximated by making use only the first one or two PCs. Different from model-led approaches such as compartmental analysis where the physiological parameters in a hypothesized mathematical model are estimated by fitting the model to the data under certain possibly invalid assumptions, PCA is data-driven, implying that it does not rely on a mathematical model. Figure 3.4: The percent variance distribution of the principal component (PC) images. Instead, it explores the variance-covariance structure of the observed data and finds a set of optimal (uncorrelated) PCs, each of which contains maximal variation present in the measured data. A linear combination of these components can accurately represent the observed data. However, because of lack of model as a constraint, PCA cannot separate signals from statistical noise, which may be an important component if it is highly correlated and dominates the multivariate data. In this case, convincing results of dimensionality reduction or structure exploration may not be achievable as noise is still retained in the higher order components. In addition, the orthogonal components produced by PCA are not necessarily physiological meaningful. Thus, it is difficult to relate the extracted components to the underlying TACs and structures in the multivariate data. Factor analysis of dynamic structures (FADS), or factor analysis (FA), can be thought of as a generalization of PCA as it produces factors closer to the true underlying tissue response and assumes a statistical model for the observed data. FADS is a semiautomatic technique used for extraction of TACs from a sequence of dynamic images. FADS segments the dynamic sequence of images into a number of structures which can be represented by functions. Each function represents one of the possible underlying physiological kinetics such as blood, tissue, and background in the sequence of dynamic images. Therefore, the whole sequence of images can be represented by a weighted sum of these functions. where C contains factor coefficients for each pixel and it is of size M x K with K being the number of factors; F is a K x N matrix which contains underlying tissue TACs. The additive term n in Eq. (3.36) represents measurement noise in X. Typically, FADS proceeds by first identifying an orthogonal basis for the sequence of dynamic images followed by an oblique rotation. Identification of the orthogonal basis can be accomplished by PCA discussed previously. However, the components identified by PCA are not physiologically meaningful because some components must contain negative values in order to satisfy the orthogonality condition. 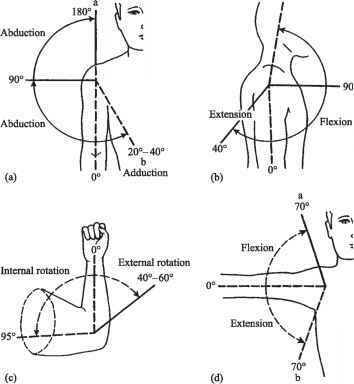 The purpose of oblique rotation is to impose nonnegativity constraints on the extracted factors (TACs) and the extracted images of factor coefficients . As mentioned in section 3.2, careful ROI selection and delineation are very important for absolute quantification, but manually delineation of ROI is not easy due to high-noise levels present in the dynamic images. Owing to scatter and patient volume effects, the selected ROI may represent "lumped" activities from different adjacent overlapping tissue structures rather than the "pure" temporal behavior of the selected ROI. On the other hand, FADS can separate partially overlapping regions that have different kinetics, and thereby, extraction of TACs corresponding to those overlapping regions is possible. with some constant a. It can be seen that Eqs. (3.40) and (3.41) are equivalent for describing the measured TAC, x, as long as f1 + af2 and c2 — ac1 are nonnegative if nonnegativity constraints have to be satisfied. In other words, there is no difference to represent x using factors f 1 and f2 and factor coefficients c1 and c1, or using factors f1 + af2 and f2 and factor coefficients c1 and c2 — ac1. Therefore, further constraints such as a priori information of the data being analyzed are required [84-87]. FADS has been successfully applied to extract the time course of blood activity in left ventricle from PET images by incorporating additional information about the input function to be extracted [88, 89]. Several attempts have also been made to overcome the problem of nonuniqueness [90,91]. It was shown that these improved methods produced promising results in a patient planar 99mTc-MAG3 renal study and dynamic SPECT imaging of 99mTc-teboroxime in canine models using computer simulations and measurements in experimental studies [90,91]. Cluster analysis has been described briefly in section 3.4.4. One of the major aims of cluster analysis is to partition a large number of objects according to certain criteria into a smaller number of clusters that are mutually exclusive and exhaustive such that the objects within a cluster are similar to each others, while objects in different clusters are dissimilar. Cluster analysis is of potential value in classifying PET data, because the cluster centroids (or centers) are derived from many objects (tissue TACs) and an improved SNR can be achieved . It has been applied to segment a dynamic [11C]flumazenil PET data  and dynamic [123I]iodobenzamide SPECT images . In the following, a clustering algorithm is described. Its application to automatic segmentation of dynamic FDG-PET data for tumor localization and detection is demonstrated in the next section. An illustration showing how to apply the algorithm to generate ROIs automatically for noninvasive extraction of physiological parameters will also be presented. j=i i=i where xi e RN is the ith tissue TAC in the data, m j e RN is the centroid of cluster Cj, and W e RNxN is a square matrix containing the weighting factors on the diagonal and zero for the off-diagonal entries. The weighting factors were used to boost the degree of separation between any TACs that have different uptake patterns but have similar least-squares distances to a given cluster centroid. They were chosen to be proportional to the scanning intervals of the experiment. Although this is not necessarily an optimal weighting, reasonably good clustering results can be achieved. There is no explicit assumption on the structure of data and the clustering process proceeds automatically in an unsupervised manner. The minimal assumption for the clustering algorithm is that the dynamic PET data can be represented by a finite number of kinetics. As the number of clusters, k, for a given dataset is usually not known a priori, k is usually determined by trial and error. ^ x e Ci Wi, j = 1, 2,...,k, i = j where x e RN is the lth tissue TAC in X; Mi e RN and Mj e RN are the ith and jth cluster centroid, respectively; and Ci represents the ith cluster set. The centroids in the clusters are updated based on Eq. (3.43) so that Eq. (3.42) is minimized. The above allocation and updating processes are repeated for all tissue TACs until there is no reduction in moving a tissue TAC from one cluster to another. On convergence, the cluster centroids are mapped back to the original data space for all voxels. An improved SNR can be achieved because each voxel in the mapped data space is represented by one of the cluster cen-troids each of which possesses a higher statistical significance than an individual TAC. Convergence to a global minimum is not always guaranteed because the final solution is not known a priori unless certain constraints are imposed on the solution that may not be feasible in practice. In addition, there may be several local minima in the solution space when the number of clusters is large. Restarting the algorithm with different initial cluster centroids is necessary to identify the best possible minimum in the solution space. The algorithm is similar to the K-means type Euclidean clustering algorithm . However, the ^-means type Euclidean clustering algorithm requires that the data are normalized and it does not guarantee that the within-cluster cost is minimized since no testing is performed to check whether there is any cost reduction if an object is moved from one cluster to another.